Like monsters? Like vehicles? Now they’re rolling into one. A cool and cute story full of speedy new heroes from hit art team TADO. Tougher than rhinos. Bouncier than roos. Cars have nothing on the Monster Trucks. If you like Disney cartoons or Moshi Monsters, you’re going to love these cool cars. Bolt, Roxy, Skittle, Masher – they all have their own personalities. Not to mention a taste for a great race… This new series has the feel of a TV cartoon or game, but in great books to rev up your reading. TADO have worked for Nike, Gola, MTV and Comic Relief, so quality comes guaranteed. 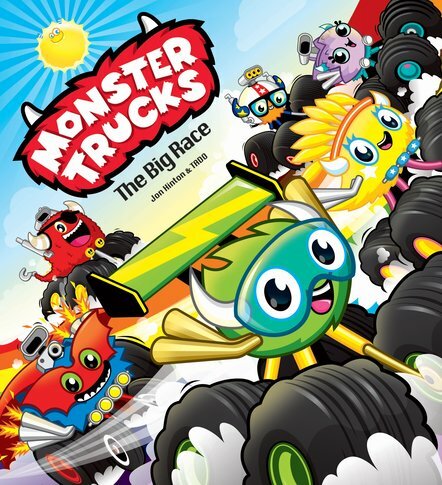 Meet a crew of monsters on wheels – the Monster Trucks!